The 1987 NBA Finals was the championship round of the 1986-87 NBA season. The match took place between the Los Angeles Lakers and the Boston Celtics. The Lakers won 4–2, beating the Celtics in the Finals for the second straight time. The key moment of the series was Magic Johnson's junior sky hook in Game 4. This was the tenth time that the Celtics and Lakers met in the NBA Finals (far more than any other Finals matchup) and would also mark the Celtics' last appearance overall until the two teams met again in 2008. This was the first NBA Championship Series conducted entirely in the month of June. The last time there were no NBA Championship Series games in the month of May was in the 1970-1971 season, when the finals (a four-game sweep that year) ended on April 30. Magic Johnson won the NBA Finals MVP award, the last of the three times he would win the award. At the time, Johnson was the only player to win three Finals MVPs, though he was later joined by Michael Jordan (6), Shaquille O'Neal and Tim Duncan. The first three rounds of the playoffs provided little competition for Los Angeles, which surged past Denver 3-0, Golden State 4-1 and Seattle 4-0. Meanwhile, with Detroit still battling Boston in the East, Riley set up a mini-training camp in Santa Barbara after the conference finals so he could fine-tune his team and get it focused on the NBA Finals. So when the Celtics finally outlasted the Pistons in seven games, then went cross-country to open the NBA Finals, they found a Laker team that was well-rested and primed to regain the title it had surrendered the year before. 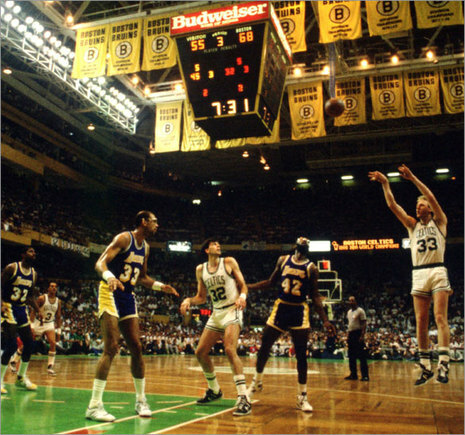 Added incentive for the Lakers was that this would be the third (and as it turned out, last) matchup against Boston in the Finals during the 1980s, and was viewed as a rubber series since each club had won once. Worthy had 33 points in Game 1, but it was Johnson who ran the show with 29 points, 13 assists, 8 rebounds and not a single turnover-a remarkable performance under the magnifying glass of an NBA Finals opener. The Lakers ran 35 fast breaks in the first half alone en route to a 126-113 victory. Boston moved Danny Ainge onto Johnson to try to slow him in Game 2, but he responded with 22 points and 20 assists and set up Cooper for six three-pointers in a 141-122 rout. Boston would win Game 3 at home, but in a playoff classic, Johnson sank a running hook shot with two seconds left to give the Lakers a 107-106 win in Game 4. That sealed the series, although Boston prolonged it by winning Game 5 before the Lakers went back home to wrap it up with a 106-93 win in Game 6. Abdul-Jabbar led the Lakers with 32 points in the finale, but it was Johnson who was voted NBA Finals MVP. 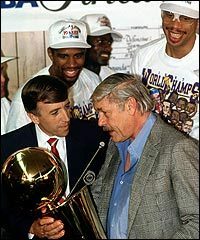 When the series was over, Riley promptly declared the Lakers would repeat as champions in 1987-88. He was throwing down the gauntlet to his talented team, and his bold words would serve as motivation throughout the following season, when they did indeed repeat.